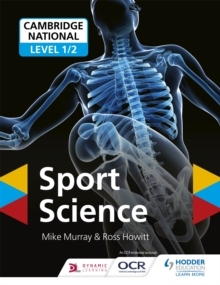 Reinforce classroom learning and strengthen your students' understanding of the content with this Student Book written for the Cambridge National Level 1 / 2 in Sport Science. Covering the two mandatory units and all of the optional units, this essential student book will help to build students' knowledge and develop the skills required for success in Sport Science. - This reliable and accessible textbook is structured to match the specification and provide your students with all the information they need, giving them the opportunity to build skills through appropriate activities. - Builds students' skillsets with clearly-focused content to aid progression and questions to assess understanding. - Prepares your students for both the internal and external assessment with opportunities to test and consolidate understanding.